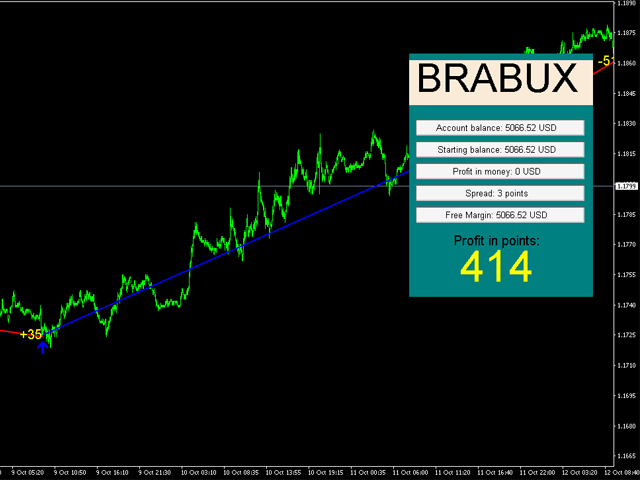 Brabux is a ready-made mechanical trading system. It works on all currency pairs and timeframes automatically adjusting to them. It also selects the most efficient trading parameters for receiving a necessary profit. In the indicator parameters, specify the trading period used for calculations and the least acceptable profit in points. Next, the system automatically selects the necessary trading parameters. Trading data is displayed on the info panel. After setting the indicator on the chart and placing desired parameters, the indicator starts selecting efficient trading parameters. At this time, the word "WAITING ..." appears on the terminal screen and the count of the time spent searching for the parameters is activated. The indicator optimization time depends on the minimum desired profit and initial trading date. As a rule, it does not exceed 200 seconds. 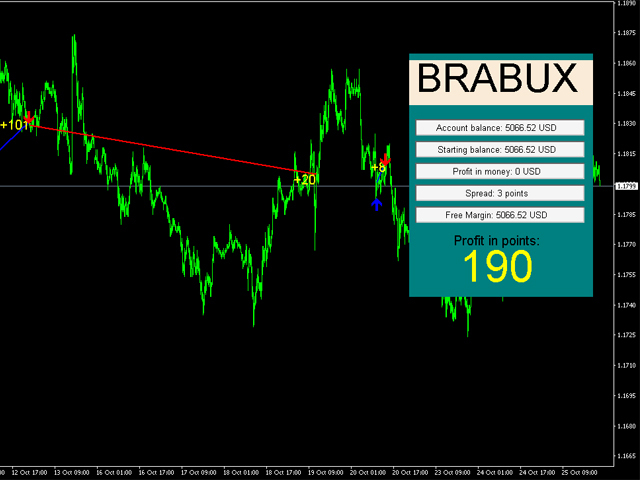 Brabux shows the moments when it is necessary to open and close trades. The system does not repaint its signals. Signals are drawn on the current Open candle. Date_start - trading start date. min_profit_points - minimum target profit in points. The indicator accurately shows when to open/close trades. The signals ate displayed on the current Open bar. No lagging.